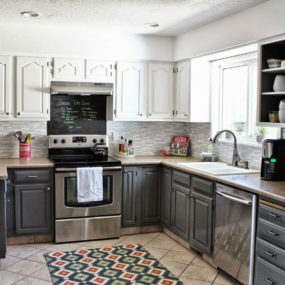 Whether you’re remodeling your kitchen or your just want to grab some inspiration for the home you hope to move into one day, we’ve got some unique ideas to grab from today. 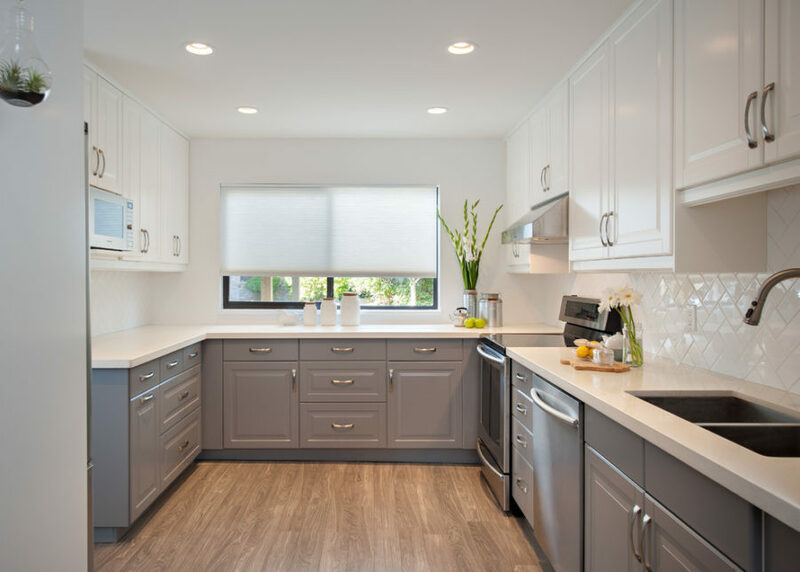 These 35 two-tone kitchen cabinets will reinsure your favorite spot in the house with contemporary style and original detailing. Check it out! 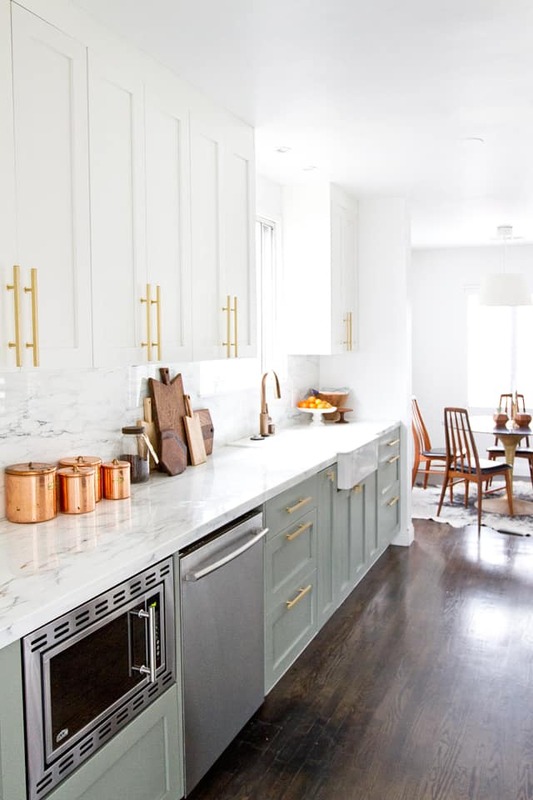 Over at HGTV you’ll find this snazzy kitchen to feast your eyes upon. 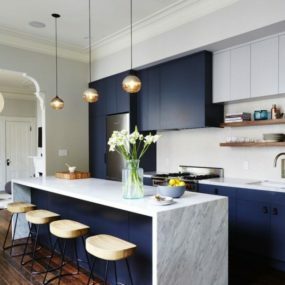 White on the top, navy on the bottom and there’s marble countertops in between … we love this nautical vibe. 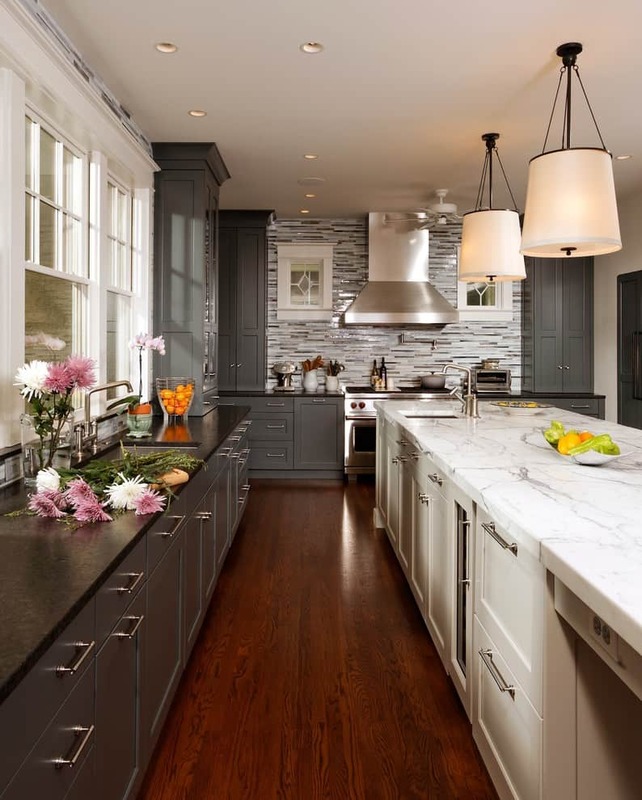 Here‘s a more masculine take on a contemporary kitchen with it’s charcoal finish and stainless steel appliances. 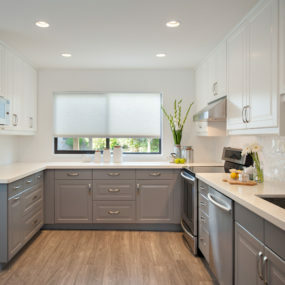 What’s great are the white cabinets up top that give it a light brightness. 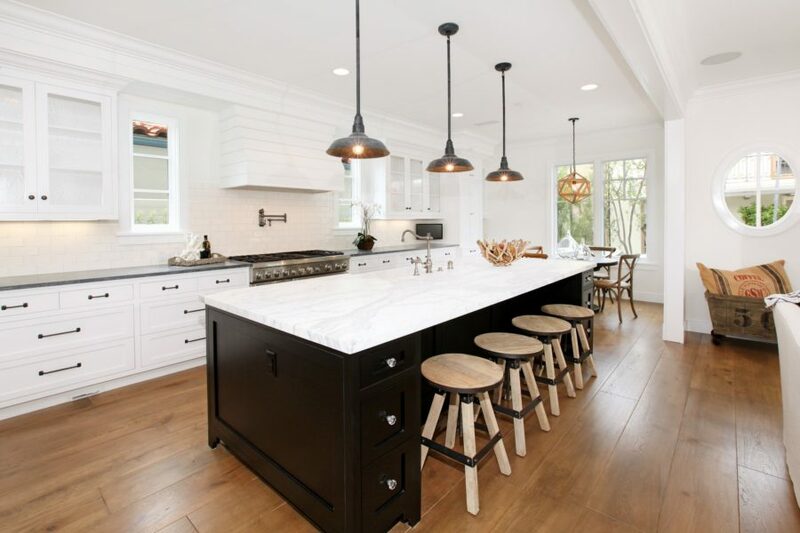 We are loving how the black cabinets at the center aisle make a visual focal point that’s both bold and clean in this white kitchen space. 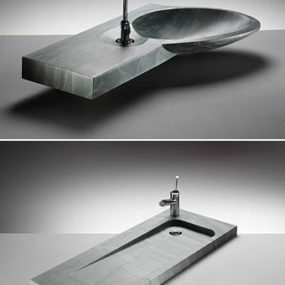 There’s a definitely contemporary and stylish element to the overall design. 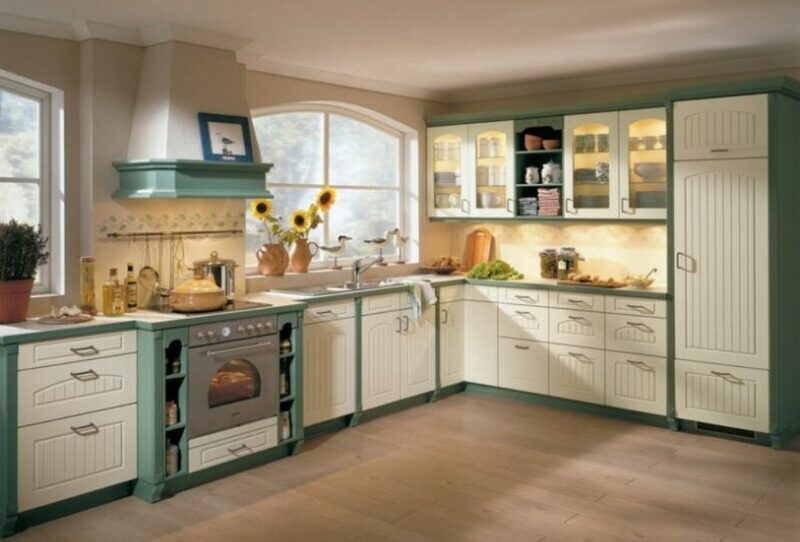 Here‘s a light and romantic kitchen that anyone would be lucky to have for their own. White on top makes the space looks bigger and a hazey gray on the bottom adds a cool charm. 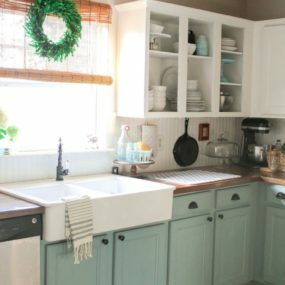 This kitchen is a bit more traditional in design but the pop of teal among the wooden cabinets makes for such a unique and personal addition. It’s a bit darker of a selection so make sure you get tons of lighting if you go with something similar. 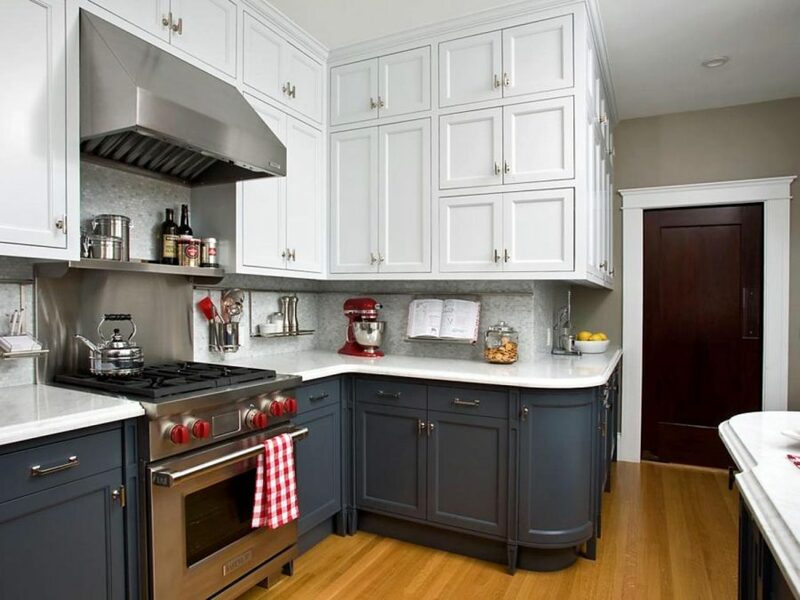 For those that like a bit of femininity and versatility inside their kitchen, this two-tone design may be right up your alley. 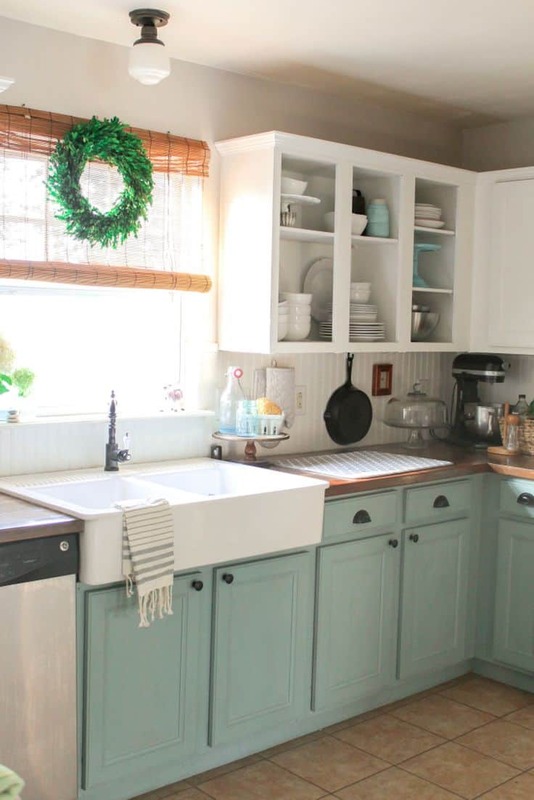 There’s a bit of a vintage, cottage-esque vibe surrounding this space too. A personal favorite of the bunch, this creamy and washed blue is quite the beauty. The shabby chic nature of the space also has a very clean, contemporary vibe that works for more modern visions. 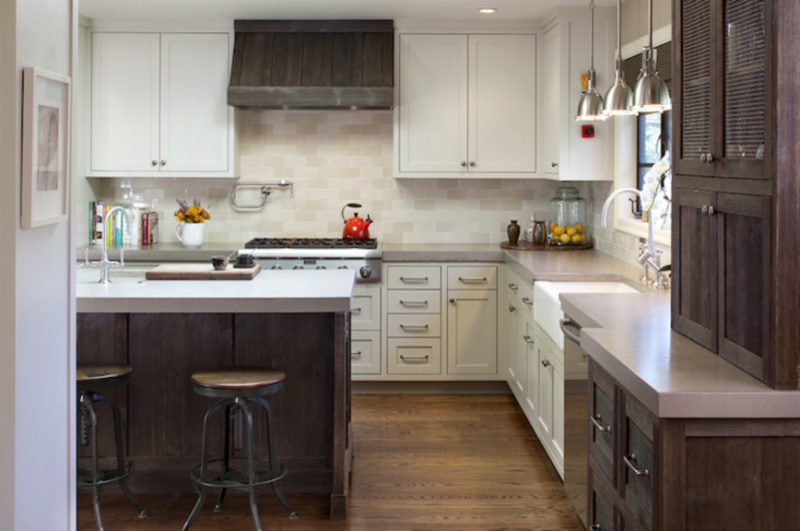 If you’re one for more country, family-oriented styling, this kitchen may be the vision you’re looking to recreate. 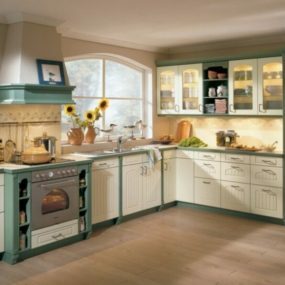 Except with this snapshot, you’ll get some sage and cream cabinets to model after. We saw this beauty over at Home Bunch and we fell in love. There’s a royal, contemporary feeling to the space and we love it’s brightness and the illusion of more space the white gives. 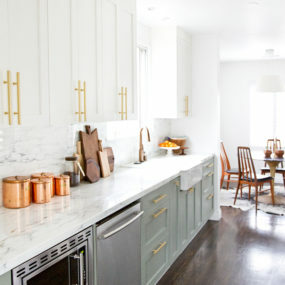 This super chic kitchen is filled with so much fashion-forward energy. 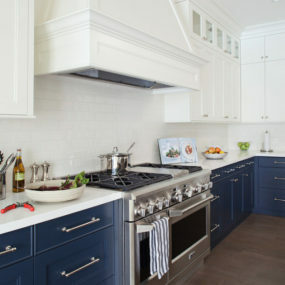 But it’s the two-tone cabinets that really make it a unique finish – pairing the stormy blue with the crisp whites. 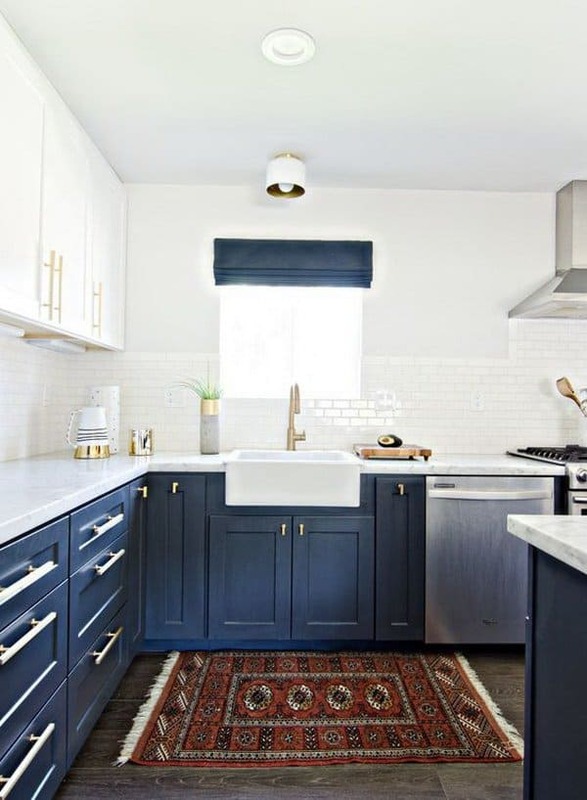 Blue Door Living inspired us with this gorgeous kitchen peek. The sage cabinets paired with the whitecaps, the marble and even the gorgeous gold hardware make this quite the luxurious design. 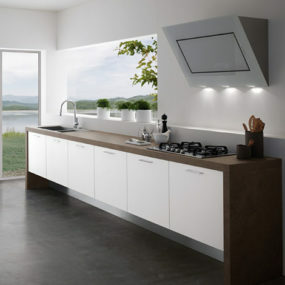 For those that really like contemporary or more futuristic designs, this kitchen will be of great inspiration to you. 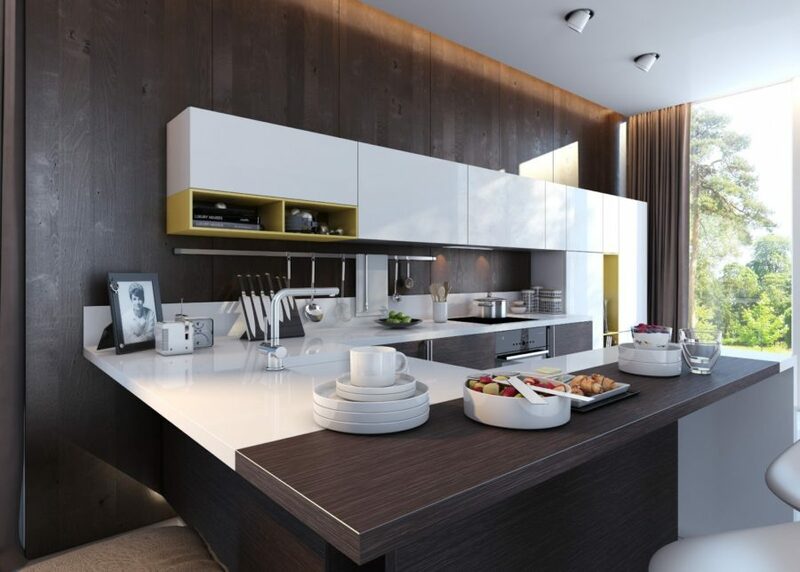 We are really loving the natural wood paired with the slick creamy accents on the chic cabinetry. 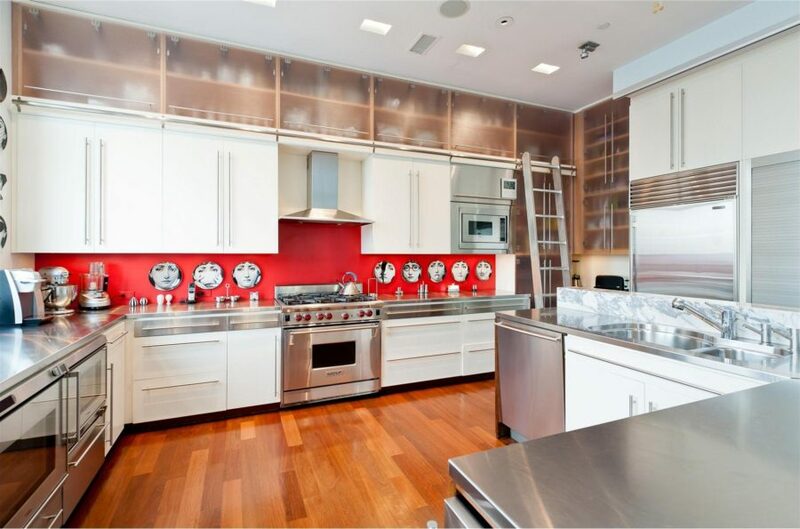 Here’s another luxurious kitchen design that will have you weak at the knees. 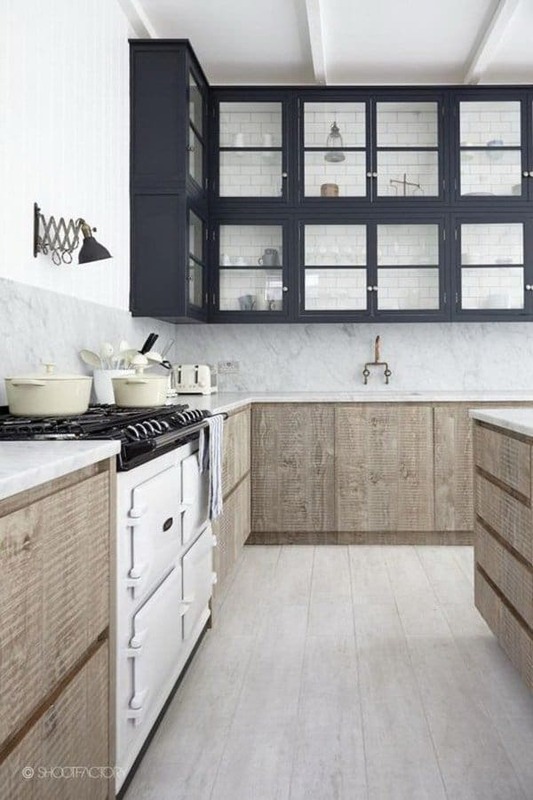 There are so many wonderful layers to this kitchen that only begin with the cream and charcoal cabinets. 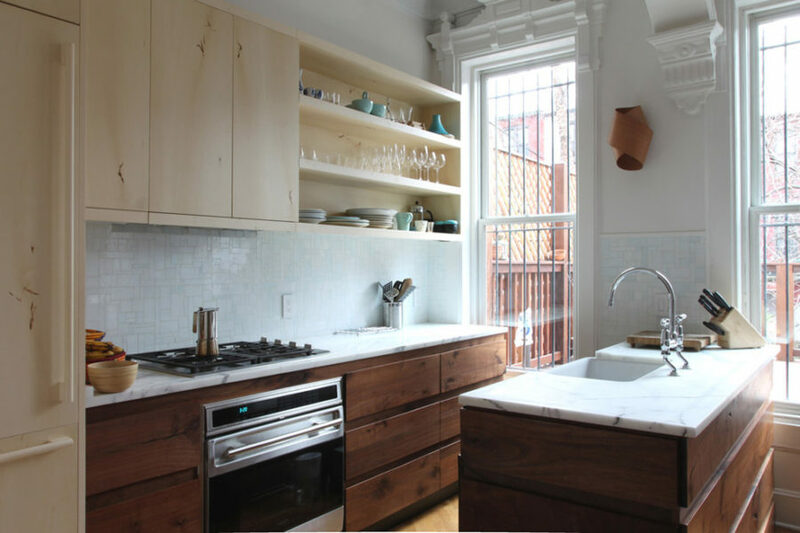 This is a different kind of two-tone cabinet and we love it all the same. 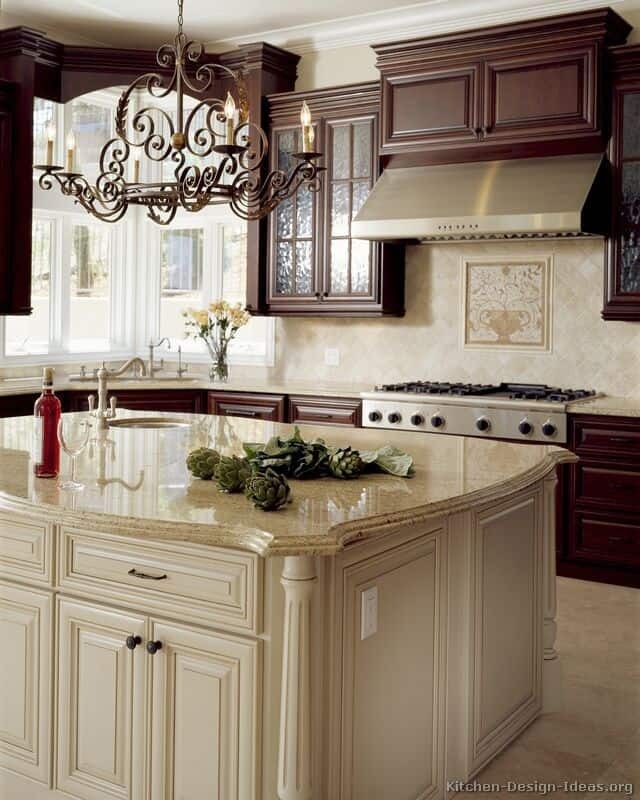 It’s subtle but it’s romantic and relaxing, which is what most of us want when it comes to our kitchen design. Hative has so many wonderful features and inspirations on their page, this blue and white peek is only the tip of the iceberg. 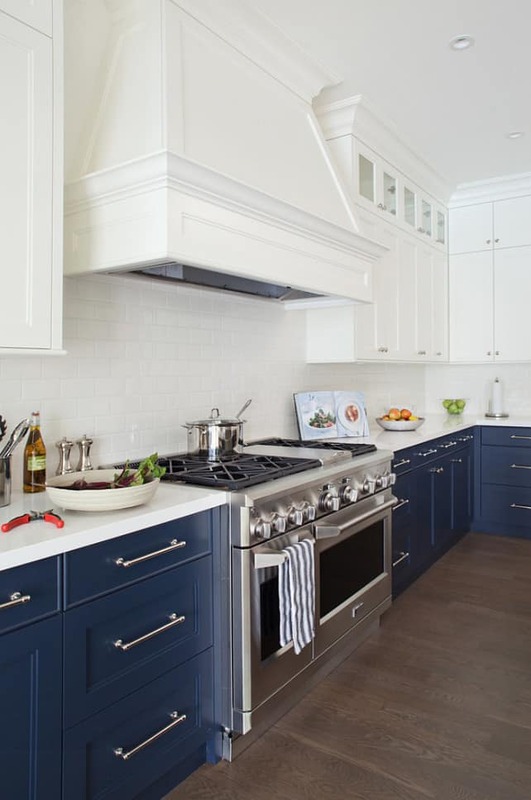 Again, the white makes the space looks larger and the deep blue cabinets at the bottom give it a bold richness. 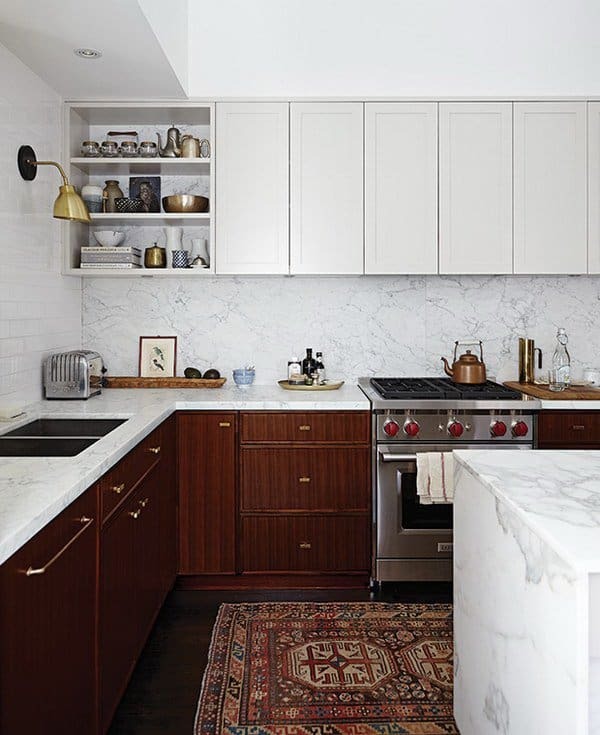 We’re loving this retro-inspired, hipster space as well, with it’s dark wood cabinets on the bottom and the ultra modern white pieces on top. 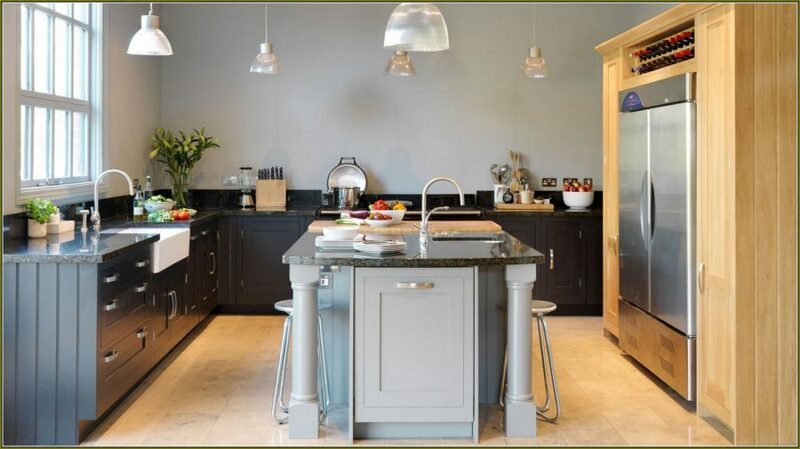 And you have to mention the gorgeous marble island in the middle! 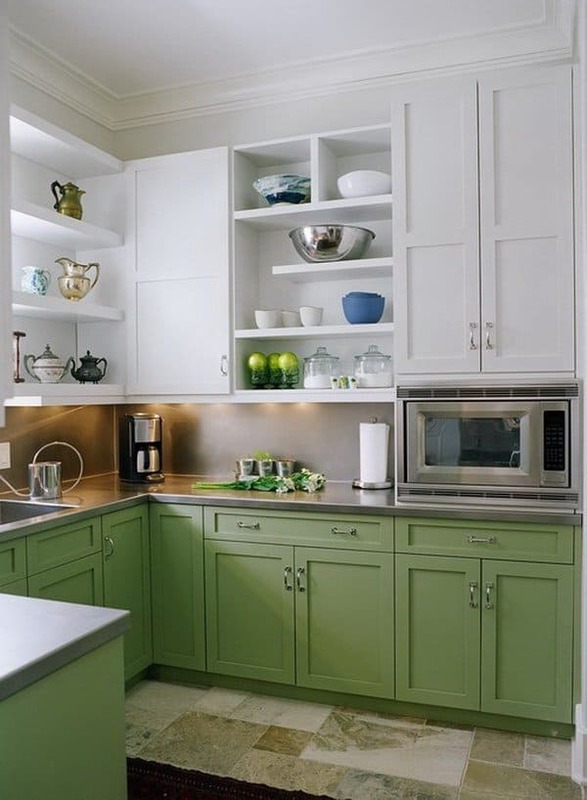 If you have a more natural and organic style, then you may want to add a bout of green to your kitchen. This design is simple and clean but personalized in a unique way with the pop of color. 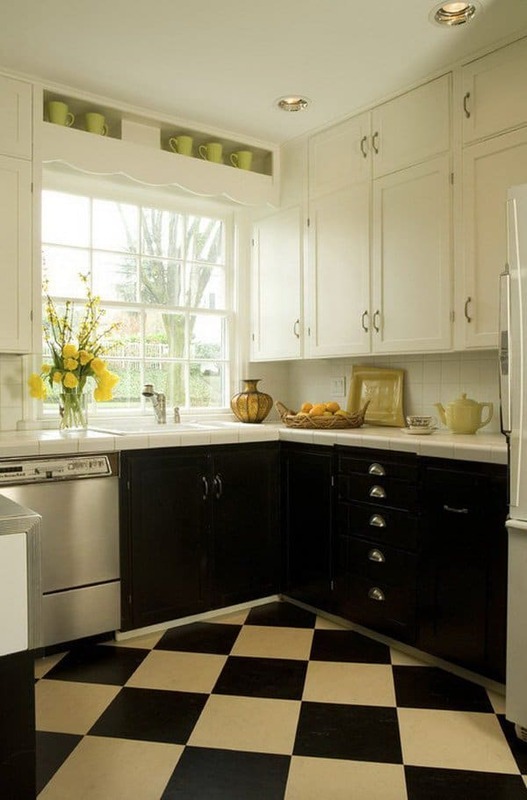 Black and white is always a classic way to go, especially when the floor ties in the two-toned cabinet scheme. 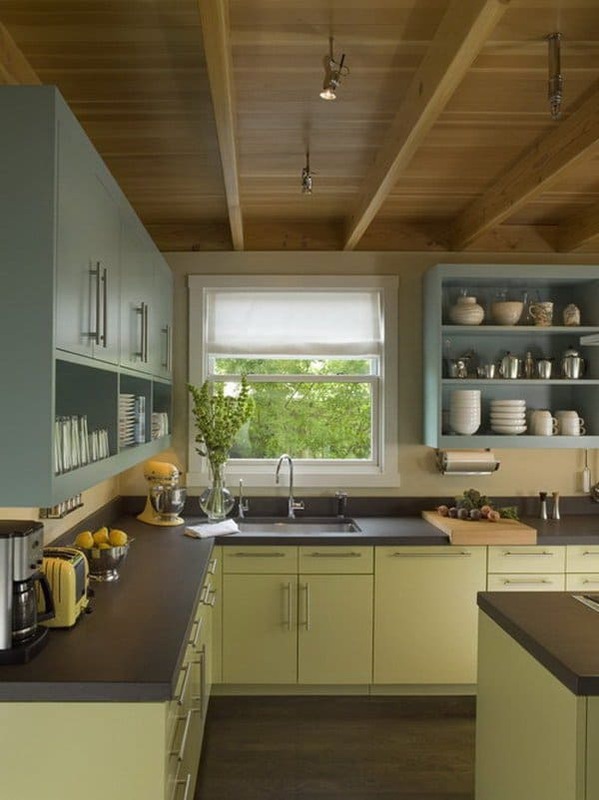 Add a bit of yellow and you have a cheerful and timeless kitchen to enjoy. Here we have a more sophisticated and more traditional design to peek at. 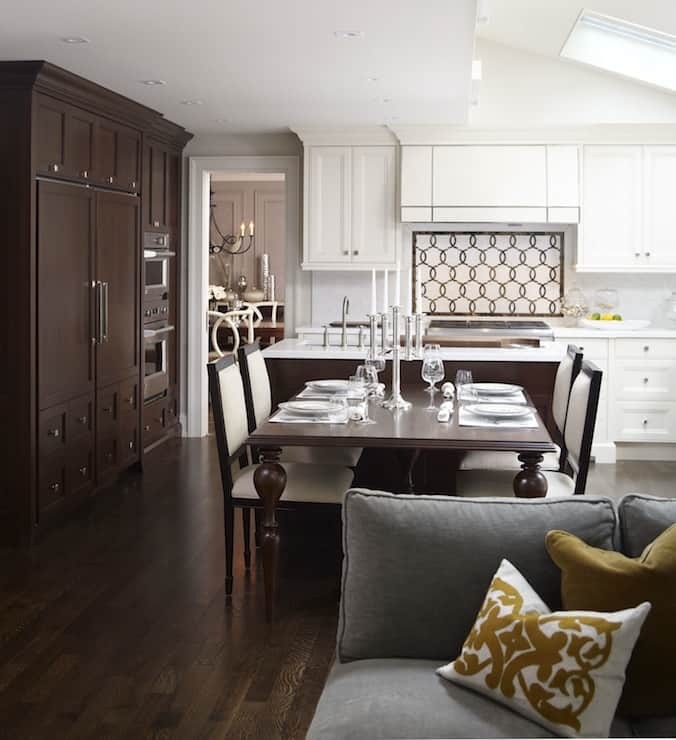 We’re loving the creamy center and the contrast of the dark wood cabinets framing the rest of the space. And now we get a peek at a more unfinished, edgier kitchen design. 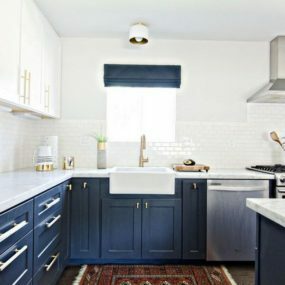 Two-tone cabinets are beautiful and this selection is even more unique with its combination of rusticism and contemporary appeal. 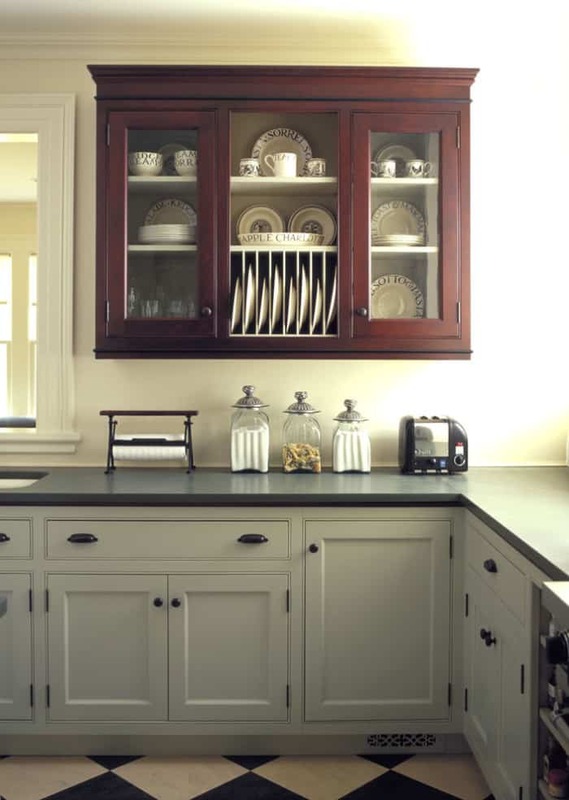 This is just another great example of combination traditional cabinet styles with a pop of rustic edge. It has a more masculine feel and a bout of industrialism as well. 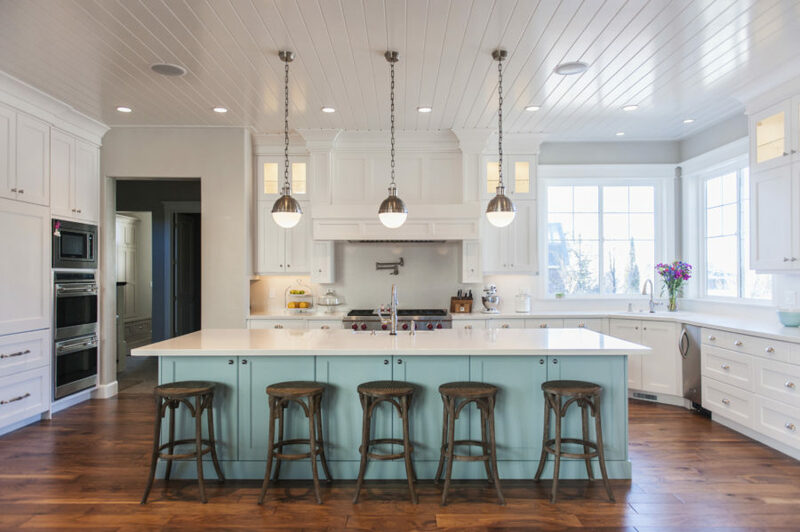 Not every kitchen has to be dressed in white, you can do a more subdued style when you has the lighting that helps to widen the space. 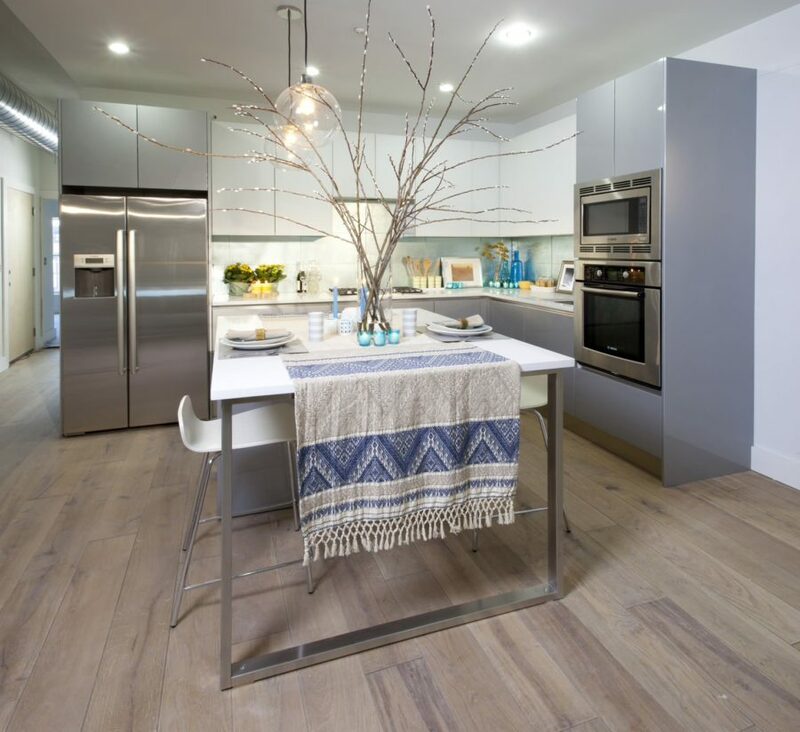 Check out this natural, light wood paired with a crisp and rich charcoal shade. 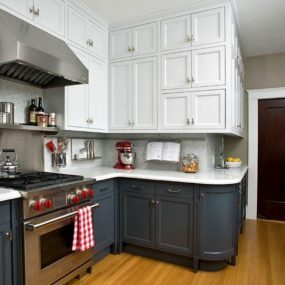 Creamy cabinets work well within a variety of styles and other colors. 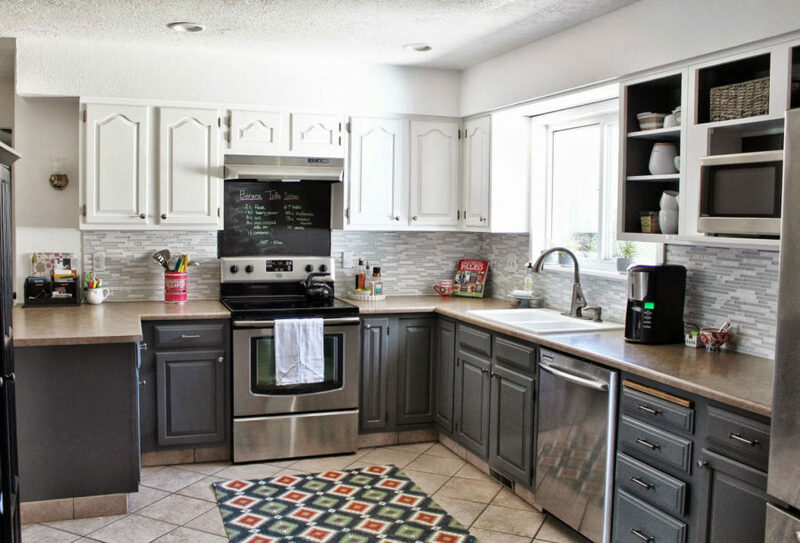 You can see here that it blends in quite nicely with a traditionally styled kitchen and more modern center island. 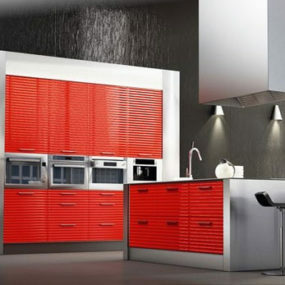 This is my absolute personal favorite kitchen design of the entire list, because I love color and I love the brightness. 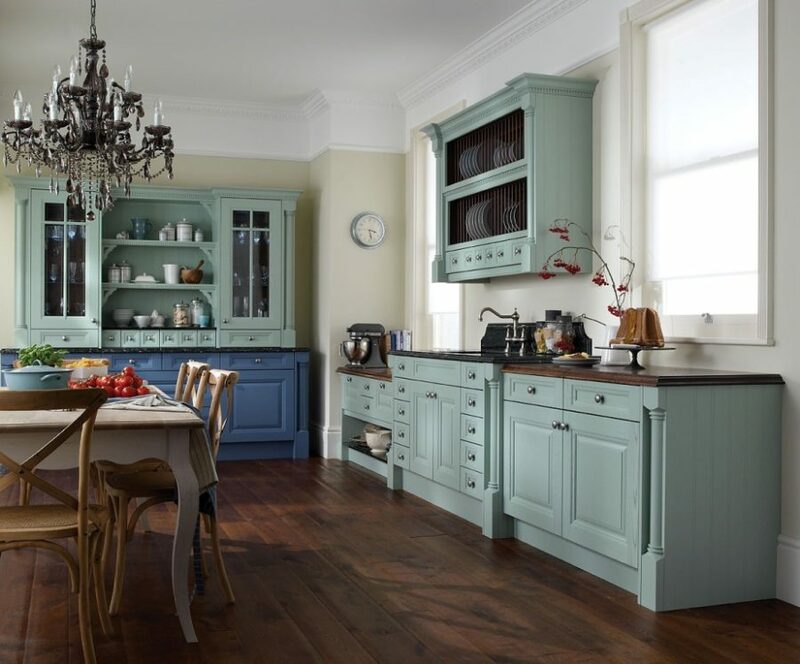 The space is so full of personality with it’s turquoise island cabinets but also function with its spacious vibe. 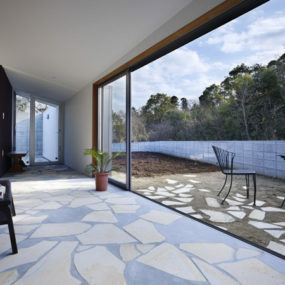 Next up is a another space that has a more masculine edge. 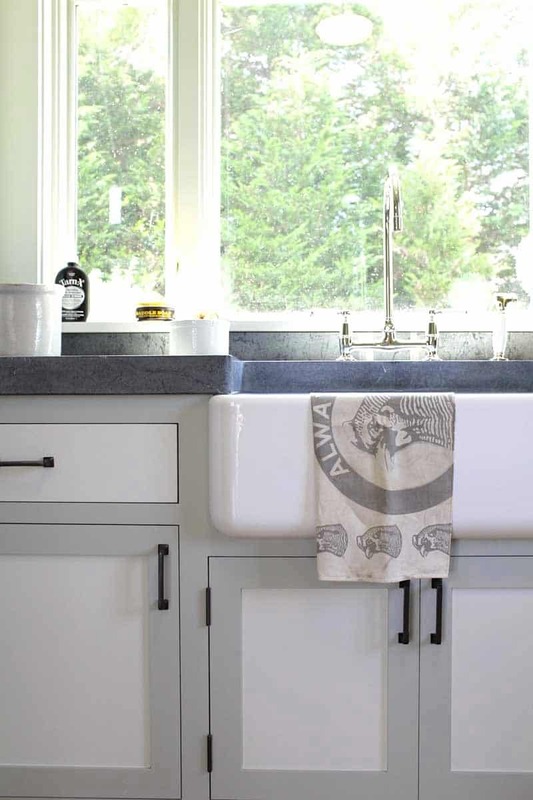 Dark wood, slight gray and deeper-toned countertops all come together to create something more chic and manly. Chocolate and white can make the same impression as a classic black and white pair. It’s timeless and works in both traditional and more contemporary of settings. 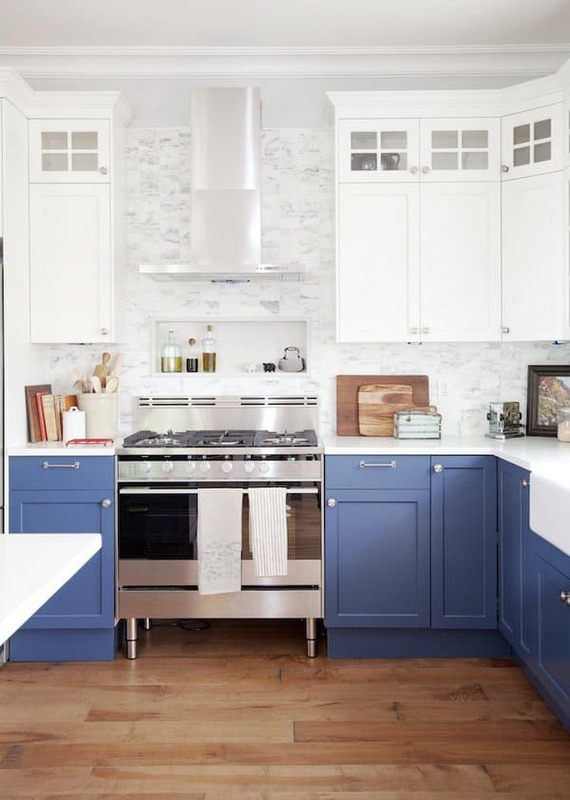 Here’s another two-tone design that’s a bit more outside-the-box than what we first think of when imagining different colored cabinets. 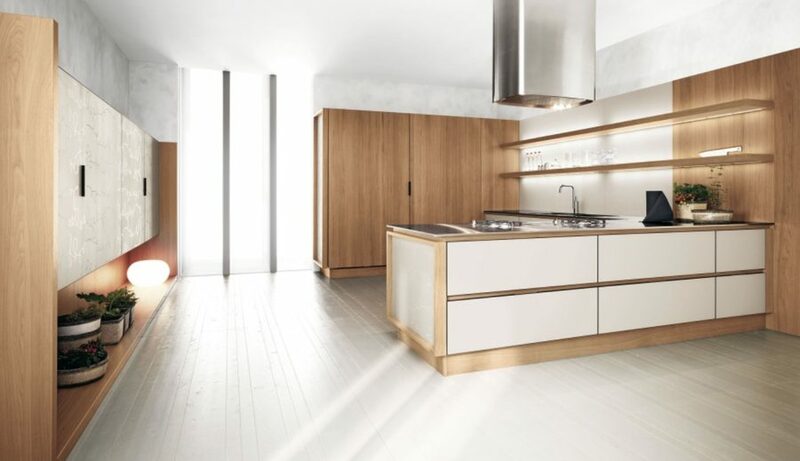 This kitchen is filled with storage that’s – in the most literal sense – actually made of two shades. 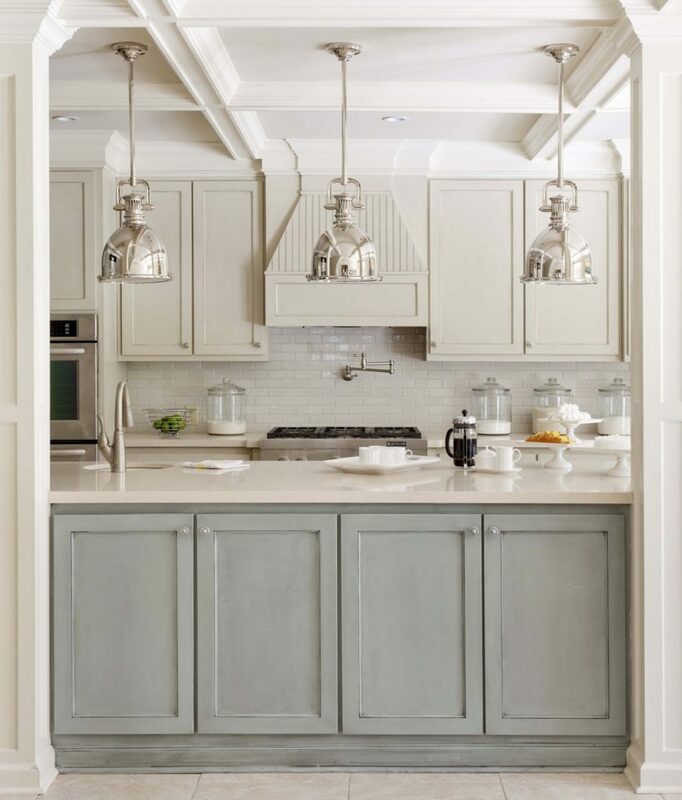 This kitchen is blended with two different kinds of cabinets – chic white on the bottoms and if you notice, illusion shelves up top. It’s a more fashion-forward way to provide storage inside the space. 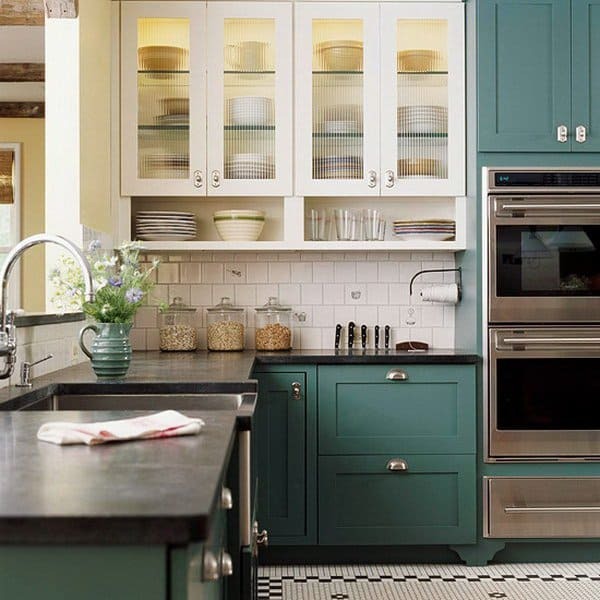 Sweet and charming, this small kitchen is sprinkled with a bout of two-tone as well. 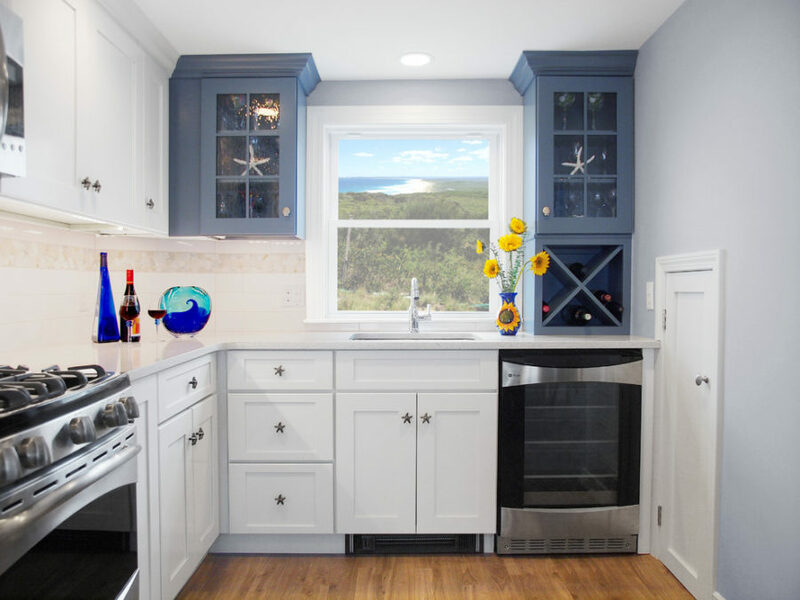 The white sets the mood and the blues help to create that beachy vision that’s happening here. 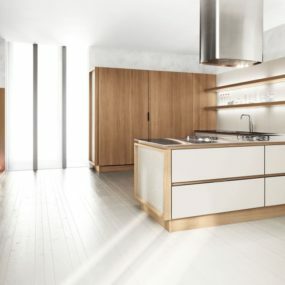 More contemporary is where this kitchen is going and we love it. 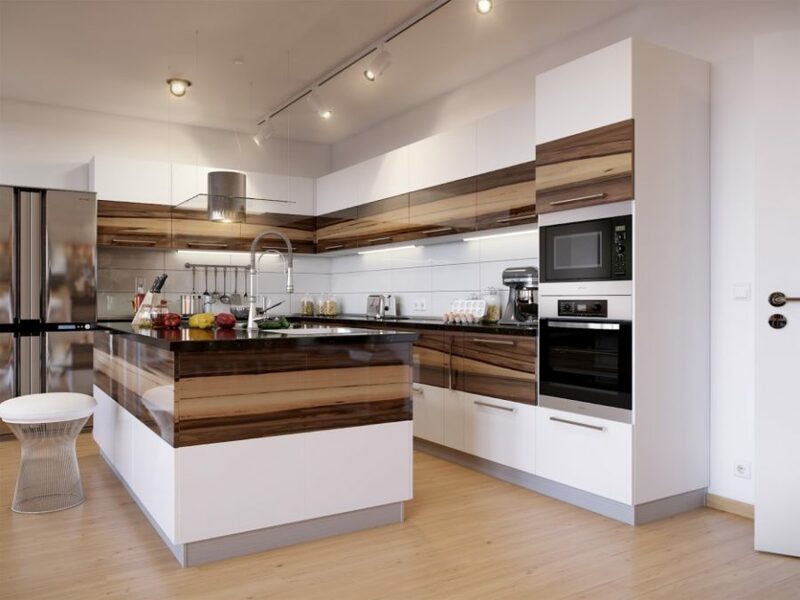 Check out the clean lines and how it’s mixing with a more textural, dark wood finish down below and on the sides. 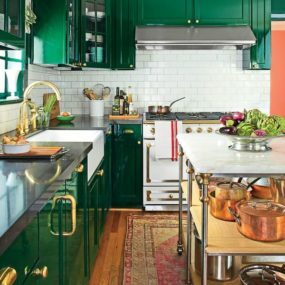 And if you’re not afraid of color, this kitchen is the one you need to grab inspiration from. 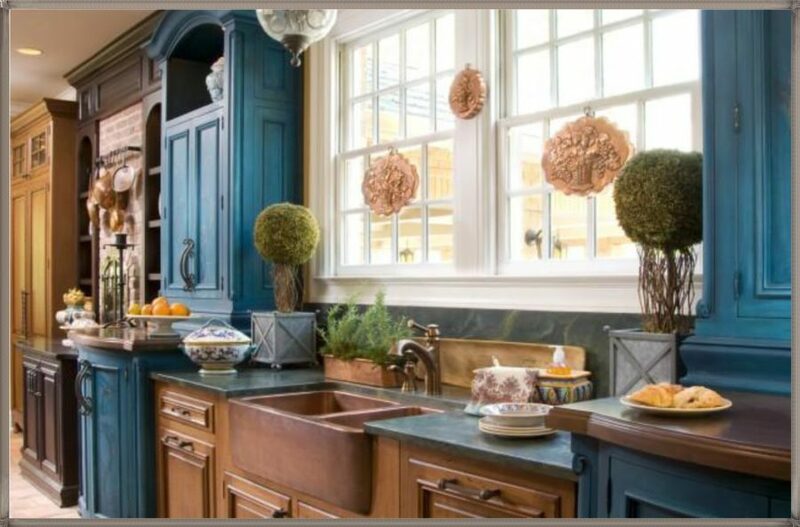 We’re loving this mix of blues and greens and how exciting it makes the larger space. 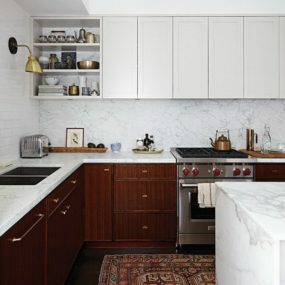 This kitchen is all about texture which makes it a much more interesting design than what we’re all used to. 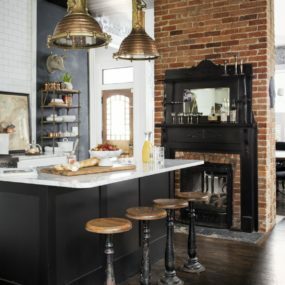 It’s a beautiful mix of old and new styles making it another very personal way to decorate or renovate. For color lovers, we have another bit of inspiration for you to take a peek at. 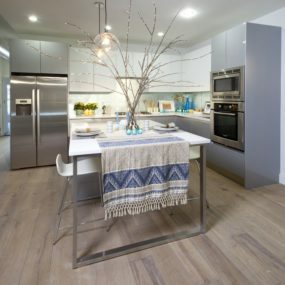 It’s a more natural color combination and makes for quite the serene spot for whipping up dinners. 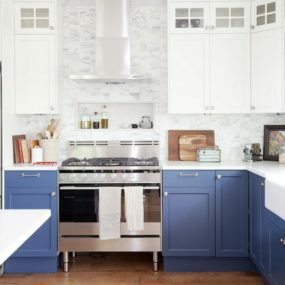 And finally, another personal favorite, this blue and white combination of cabinets has such a fresh and charming sense about it that your family and guests will be swooning. It’s bright and makes for such a welcomed spot in the home.